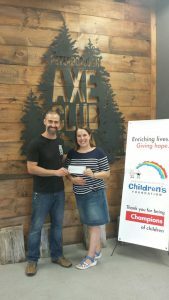 THANK YOU PTBO AXE CLUB!! We threw axes. We sent kids to camp! 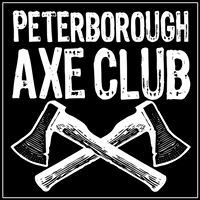 We offer heartfelt thanks to Carlo Raponi, owner of the Peterborough Axe Club! Being a gracious host was only part of his contribution to our AXE-Travaganza summer camp fund raising event . Shown here, Carlo presents Kim Fenton, Board Chair of the Kawartha-Haliburton Children’s Foundation with a cheque for $1,090.14 – 55% of ticket sales from the night. Carlo and the smiley staff of the Peterborough Axe Club helped make a fun-filled night into a summer camp success! We sure hope you’re up for this again next year Carlo!! Who knew raising money could be so much fun? Axes and Summer Camp do go together, after all! Thanks again. Previous Previous post: Local Credit Unions Support Summer Camp! Next Next post: Back to School with BELL Backpacks!